weekend and grabbed a few props (that I already owned! ), dressed the kids up and on we went to our backyard. Christmas photos can be difficult to shoot with small children, trust me, I know! So I wanted it to be easy as 1,2,3. My kids will only give me about 20 minutes of their beautiful smiles before they are over any type of photo session. 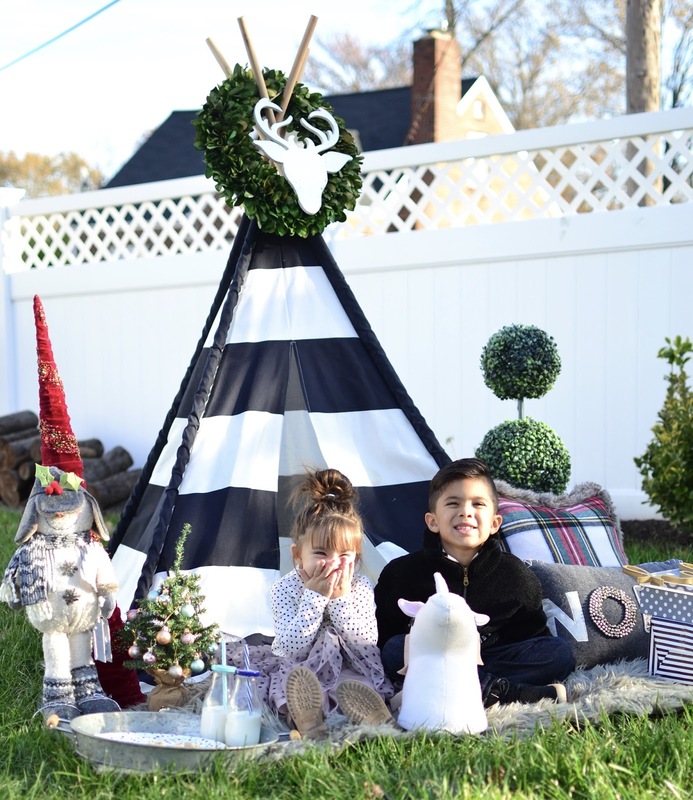 Therefore this DIY Christmas photoshoot happened quick and I was the one behind the lens this time around. I did recruit a couple of assistants, my mom and husband! So let's get started with 5 tips on how to rock your DIY Christmas (or holiday) cards this year. You still have time, if you haven't done so! keep scrolling for my tips on how to rock your photos this year! 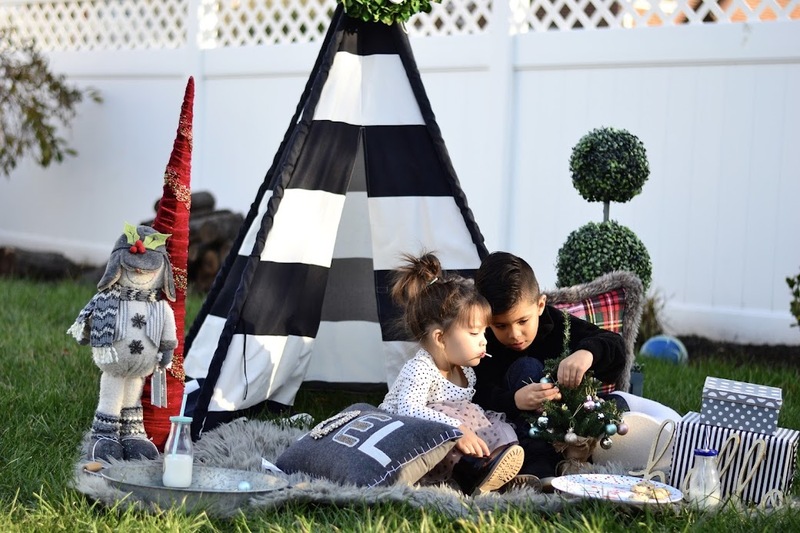 Kids have very little patience, so be sure to prepare your space or room for the shoot even before you dress them. 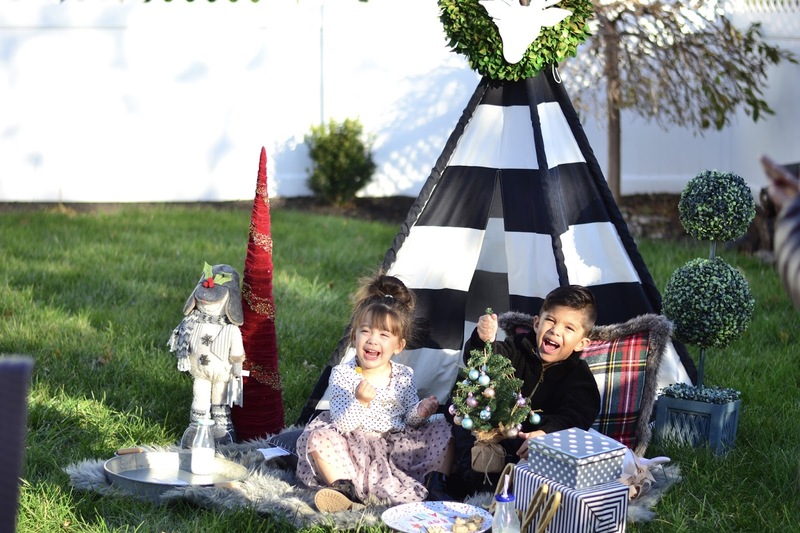 I grabbed a few props from my house, like my teepee tent, a few Christmas decorations, a tray with milk and cookies and of course a lollipop or two for Emme! Make exceptions and give them what they want for a little, I promise it makes life easier. Even if you have to give out a couple of sweets! 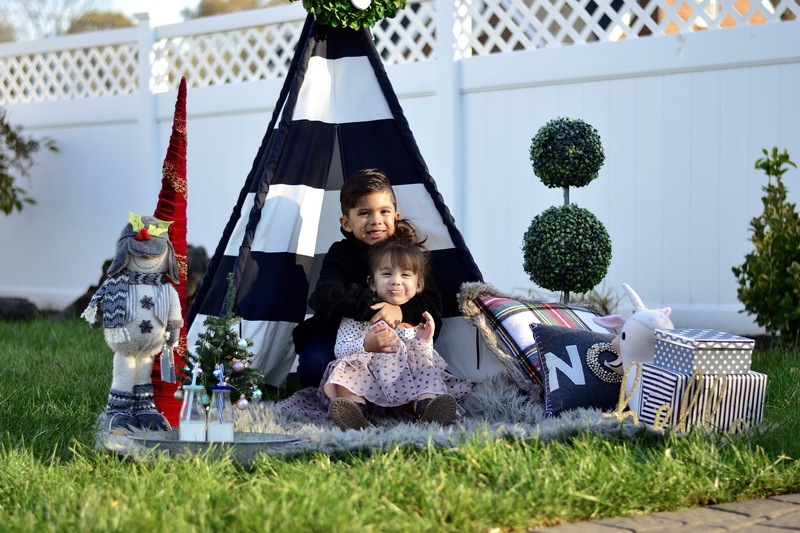 I set up the whole thing on a faux fur rug and once I was done I got to dressing the kids. 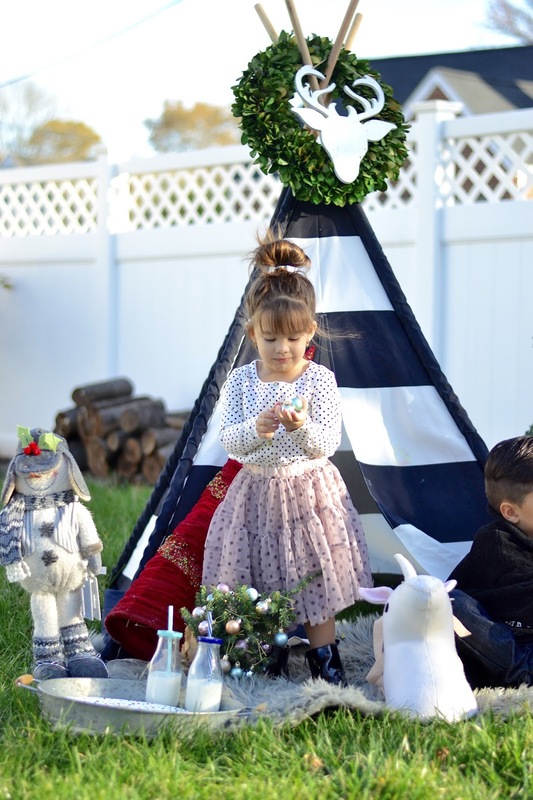 Listen, I love cute kids clothes and I love to dress my kids up for any occasion I can, even if we are going to our backyard! I purchased Emme's skirt on super sale for like $7 at H&M a few months ago. And Ben wore a cute sweater my mom brought him from Ecuador. Even though they look cool and stylish, my main priority is for them to be comfortable. Make sure the kids are comfortable in their clothes so that they are not cranky because that can escalate fast. You only have a few minutes so make it worth it. For this photoshoot I used my old(er) Nikon D3100 but I am here to tell you, you can use your iPhone to shoot some great photos! My recommendation is to absolutely shoot either outdoors or inside using daylight to make sure you have better quality and a better looking photo. I just personally love natural lighting in pics. The iPhone 8+ and the X have amazing cameras, so don't worry if you don't have a DSLR or can't pay a professional, I can guarantee great photos on your phone too! I can't take all the credit for this idea. I saw something similar on Pinterest (of course!) and made it my own. So you may be saying well, Erika, I don't have all those props and I don't have a tent... Girl! Get your creative juices flowing and if you're not the creative type, search Pinterest for ideas. Remember your kids are the focus and they are cute as a button so no matter what your pics will be cute! 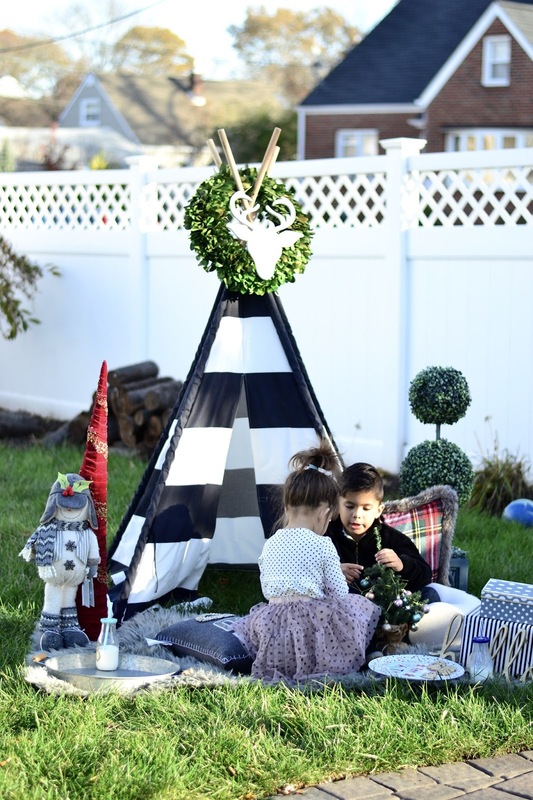 If you don't have a yard, that's ok, you can even shoot in front of a white wall... hang up some Christmas lights, throw down a rug and wrap a few empty boxes and voila! I mentioned I shot these in 20 minutes and I am not exaggerating. I may have about 500 photos because of it, I just kept shooting, I knew I would get at least one good one. The idea, for me at least, is to get non-posed photos and get the kids in their element, being sweet and silly without instructing them too much. If you follow me on Instagram, you may have noticed that most of my photos with the kids are in our natural element, super organic and just chill. So don't get upset if they are not listening, some of my best photos are the ones that they are just doing whatever they please. Yes, I said it, bribe them if you must! Bring out their favorite toys, include their favorite cookies as props, give them a lollipop or two... make it work. If you are a parent, you've been there, I am sure we all have, that moment when you have to bribe your children to get them to take that one pic, where here is your moment. Trust me it works, that's why you see Emme with a lollipop in her mouth in some of these. Her patient was running short and I had to pull out the big guns; lollipop and My Little Pony toys. This is actually the very first year since Ben was born that we (Dave and I) are not in the Christmas card. Again, no time to schedule a professional, not time to plan outfits and no time to take out time, ha. But in the past we have even used a tripod to shoot our pics, with the standard Nikon camera lens and I was pregnant with Emme that year, you can see them HERE. 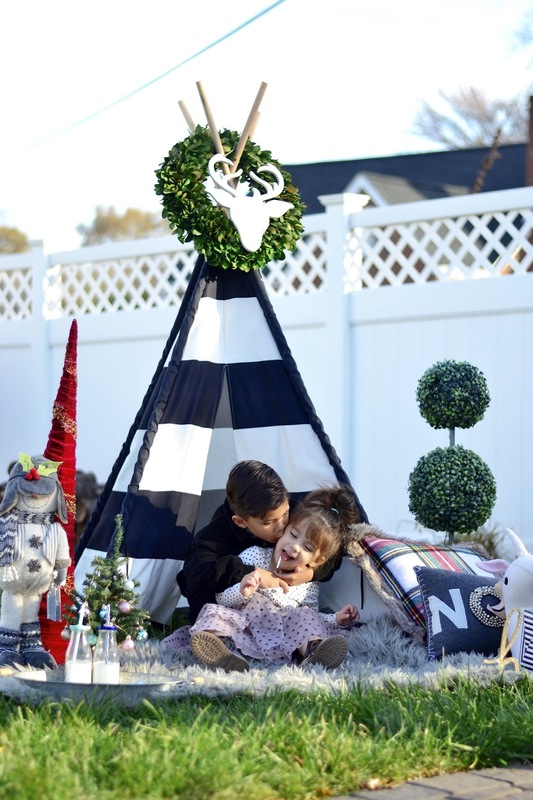 So what I am trying to tell you guys is that you don't need a crazy expensive camera to shoot your own holiday photos and if you don't have the budget for a professional photographer, don't feel bad, try these tips on how to take your own Christmas photos and let me know how it goes for you! 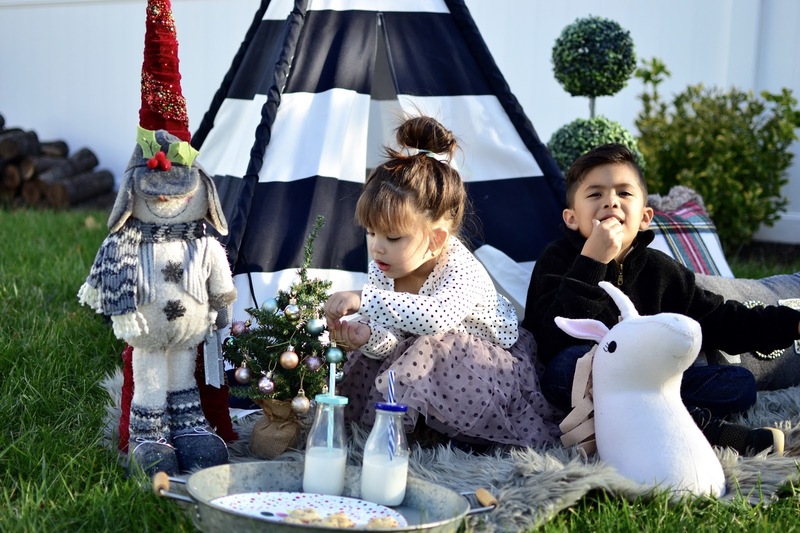 These are clearly not the best quality photos or even the lighting is a bit too bright on some, the sun kept shifting on us, but that's ok because the kids had fun and I love these pics of my kiddies, super natural and very them. As you guys can see Ben is really extra loving (like his mama!) and he kept hugging and kissing Emme lol... love that boy!